It’s still winter, last I checked. In fact, we’ve got two more months of it left. Depending on where you live, there’s snow on the ground. Frosty breaths may be the norm. 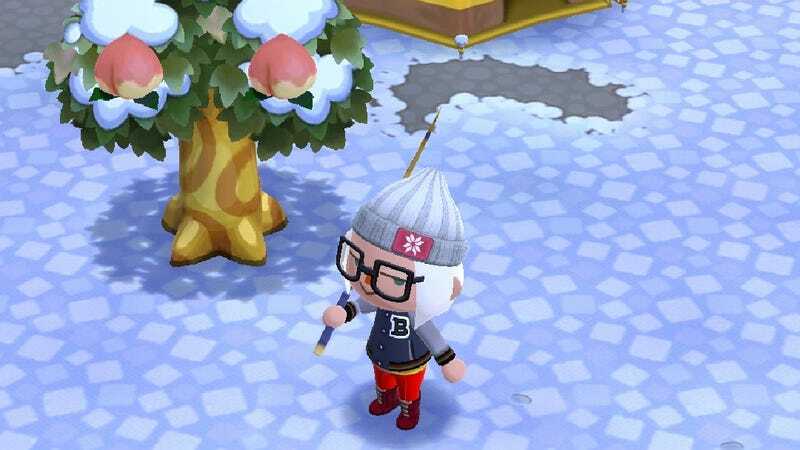 So why, then, are these trees in Animal Crossing’s universe trying to act like it isn’t really freaking cold outside? The obvious answer is that spring is coming. Soon, Pocket Camp’s passage of time will technically join ours, and spring will be in full-bloom. But Animal Crossing follows a perfect, made-up world where the seasons behave according to clockwork schedules. There’s no nuance. Sometimes in the real world, snow still has a chance to fall in April. In Animal Crossing, April showers brings May flowers (actually, flowers remain year round in Animal Crossing. They’re rather resilient to be growing through the snow when all of my real plants look like they’re bereft of life outdoors). And so, what’s really happening is that I smell sorcery, and it’s not just that peaches (and other fruit such as oranges and cherries) are growing in the dead of winter—with snow covering their branches, no less. Something that’s true of the series, anyway. This life simulator game and its sugar-coated reality is rushing life’s details. Pushing me to be envious of a better way of living than what is actually happening out here. That’s always been the case. Animal Crossing on Switch, when? When Will Our 5 Year + Nightmare End? I&apos;m Still Failing To Stop Playing Animal Crossing: Pocket Camp. Now Thanks To Butterflies.